The attention economy has changed sales forever. Buyers today are more connected, more informed, and more apt to doing their research online before they ever talk to a sales person. They're evaluating their options, and evaluating resources and peer recommendations to help them in their decision making. 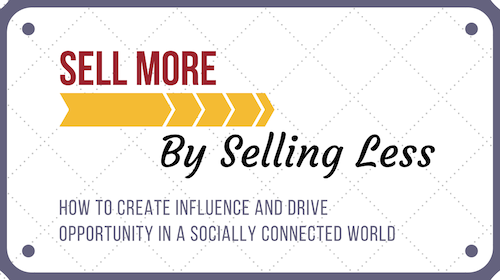 Social selling is the art of using social networks like LinkedIn, Twitter, YouTube and Facebook to find, connect with, understand, and nurture opportunities with your ideal audience. It’s the modern way to develop meaningful relationships with potential customers that keep you and your brand -- both your personal one and that of your organization's -- top of mind, making you the natural first choice for consideration when a prospect is ready to buy. Sales professionals who have integrated social selling techniques into their sales process way outperform those who are stuck in the old way of doing things. So, yes...you really can "sell more by selling less" -- when you drop the old-fashioned, interruptive and often aggressive tactics of the past and instead become a valuable trusted resource all along a buyer's decision making journey - attracting opportunities, rather than chasing them. "Sell More by Selling Less" is a course that will help you get there. Available on demand or via live web meeting. Ongoing support via email and Facebook group. This course is delivered in brief learning chapters along with assignments that encourage you to put what you learn into practice in real time. This proven step-by-step approach helps build your skills and confidence to help accelerate your results. Ask about our flexible group discounts. If you prefer a more personalized learning experience, this course is also available via live coaching sessions for individuals and teams. Count on a trusted, confidential relationship with someone who cares about your success and will hold you accountable to better achieve it. Working with a coach provides the extra guidance, discipline and confidence you need to achieve your goals.